Most people love sports. Those who play the game and those who watch from the sidelines want to be connected with one another. If you want to make an impression with the ultimate sports fan, promote the home team! Let fan loyalty work to your advantage and give you a way to stay top-of-mind. If you’re looking to attract fans who want to be close to their favorite teams, offer them the information they need in terms of game schedules, practice times, and local meet and greets where they can interact with their favorite players. Providing potential buyers with the right information is essential if you want to close the sale. Sports fans want to support their team in any way they can. If they live close by, many will want to attend games as often as possible. Use your newsletter to cross-promote with other local businesses who may be offering incentives, such as season tickets, or admission to an event that is sponsored by the team. Provide your sports fans with recipes or ideas for throwing a great tailgate party. Tailgate parties are always fun and it gives fans a chance to gather together to show the team they are there to cheer them on. As a realtor, you can sponsor a tailgate party. Hand out recipe cards for the best in tailgating foods. Give participants game schedules and encourage them to set up future tailgate parties well in advance. Sports teams get excited when they see this type of support and, in some areas, may even stop by. When you want to attract the sports fans, you do so by giving them the things they need to make supporting their team easier. The key is to show potential buyers that you are just as big a fan as they are! Show your team spirit! 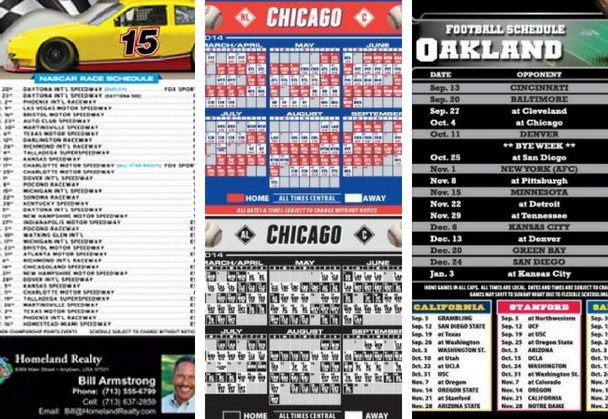 Keep a few extra team schedules in your car and hand them out whenever you notice a tried and true fan. Odds are they already know the schedule, but with one of yours, they will get to know you too! 2018 season schedules are now available for Football, Hockey, Baseball and NASCAR. We offer a variety of sizes including business cards and full magnets. Order now before the season begins!